International Snow Science Workshop (www.issw2018.com). The online abstract submission is open until April 23, 2018.
contributions highlighting practical experiences and applications are as important as scientific articles. Especially for participants and researchers from North and South America, Eastern Europe and Japan, the practical know-how in the areas of engineering, avalanche forecasting and avalanche commissioning as well as rescue service is of high interest! 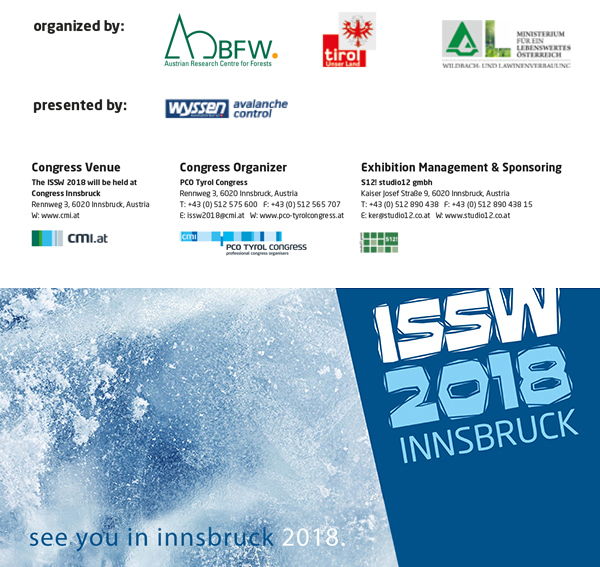 Therefore we encourage all interested parties to enrich the ISSW in Innsbruck not only by their participation, but also by contributing in the form of oral or poster presentations. The submission of short abstracts is possible in all four conference languages and simultaneous translation of main lectures will be provided during the conference in English, French, German and Italian. The registration for the ISSW2018 will be possible from March 26, 2018. On behalf of the Organizing and Program Committee we are looking forward to your submissions.